Stunning views open at various points on the trail below Katahdin. Here three mountains — The Owl, Mt. O-J-I and Barren Mountain — make for a fantastic view over one of the ponds. O-J-I got its name from the rockslides that make those letters on its southwestern side. The goal: Mount Katahdin, Maine. 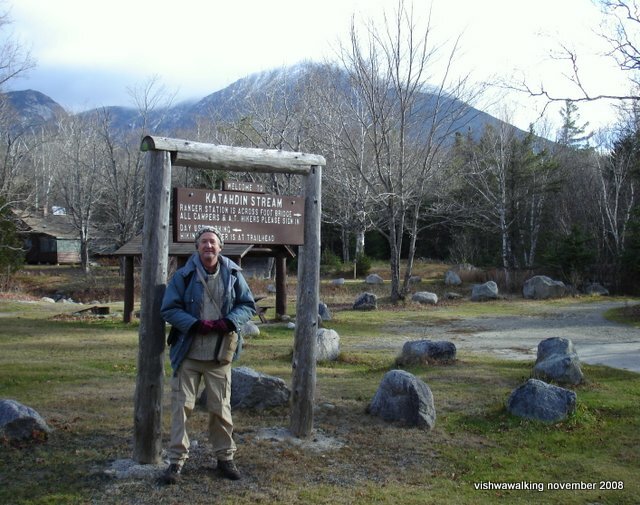 Here I am on November 2008 at the base of the mountain. It was not safe to climb in late fall, with ice at the summit. It was a chilly morning when my son and I arrived at Baxter State Park, but it soon warmed up. Mount Katahdin is in the background shrouded in clouds. 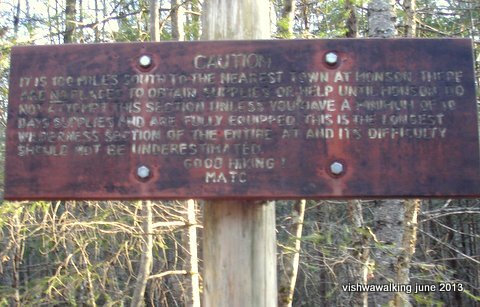 Since we couldn't climb the mountain, my son Matt and I took a couple of days to walk the roughly 10-mile stretch from Katahdin Stream Campground to Abol Bridge, plus a mile of the "100 Mile Wilderness" just to say we walked a bit of it, and to get a glimpse of the white cedar swamp. To generalize: the walking was pretty flat and easy, with a couple of exceptions. There are a couple of streams to ford and in November they can run fast and cold. 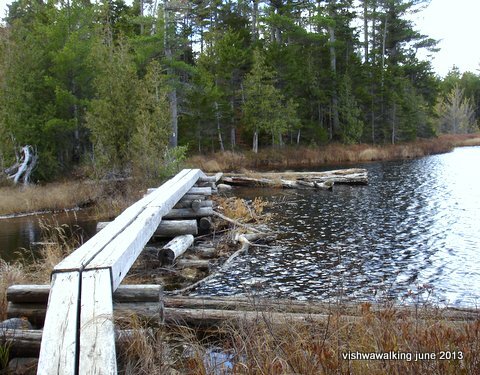 Above: a log bridge on the east side of Tracy pond or Elbow Pond. These were fun to traverse and very solid. 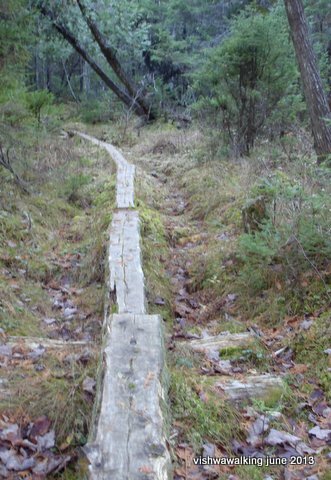 Left: a log path into the swamp pine section at the north end of the "100-mile wilderness." 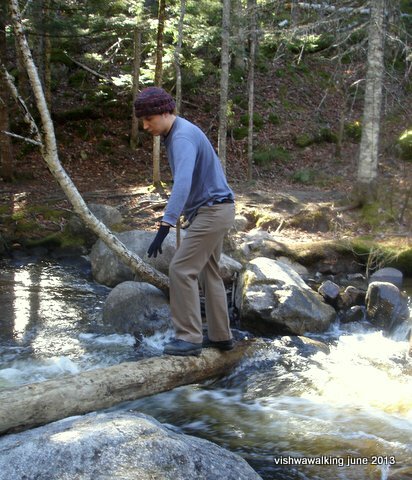 The general walk Beside Tracy and Elbow ponds (with handy boards to cross some of the wetter spots — see the photo above) and the beautiful stroll along the West Branch Penobscot River made for a fine weekend hike. 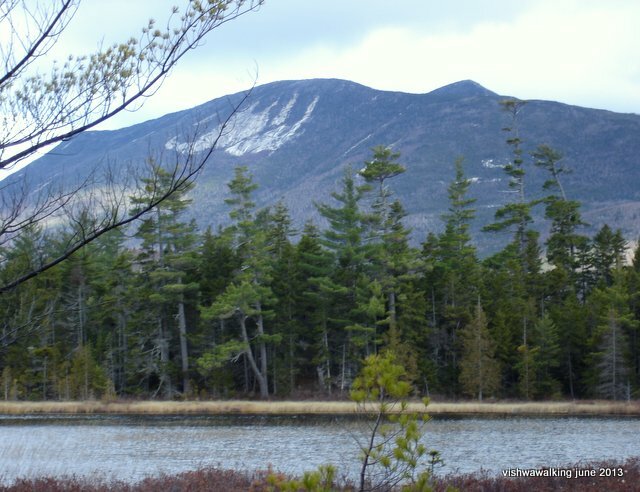 In the early sections by the Tracy and Elbow ponds and by Big Niagara falls on Nesowadnehunk, the vista opens and there are fine views of mountains such as The Owl, barren Mountain and O-J-I. We were able to find a reasonasbly cheap motel in Millenocket for our weekend jaunt. However, restaurants were scarce, especially after hours. On our last day, we finished hiking late and tired and had to tolerate a lousy MacDonald's meal as it was the only place open at 11 p.m.
Millinocket, out of season at least, is a sleepy town. Never mind: a mattress, good shower and a beer and we were back in the game.